Anno 18 Caroli Regis, 1642. DIE Lunæ, videlicet, 18 die Aprilis. Committee to audit Mr. Parramour's Account of Pollmoney, and consider of a Reward for his Trouble. County of Durham to have Representatives in Parliament. Scots Commissioners desired to send to Scotland the King's Message about His going to Ireland, and the Petition of both Houses against it. 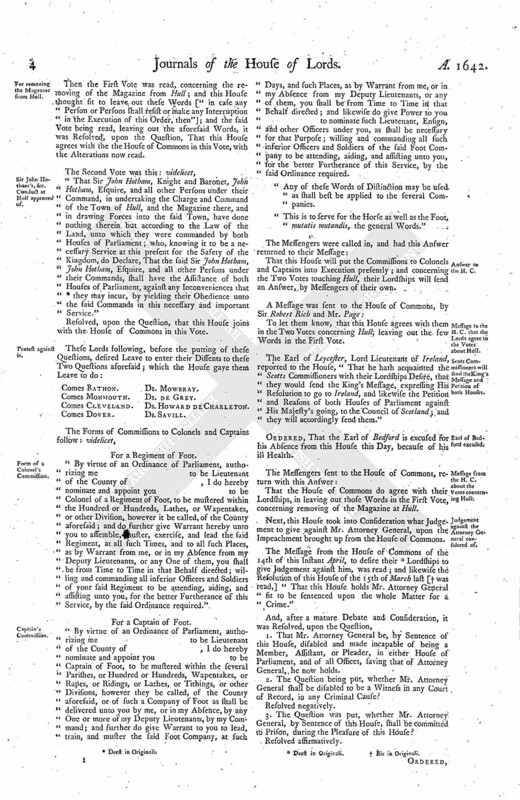 Papers from the Scots Commissioners, concerning the Treaty about Ireland. Message from the H. C. with the Draughts of Colonels and Captains Commissions for the Militia. For removing the Magazine from Hull. Sir John Hotham's, &c. Conduct at Hull approved of. Form of a Colonel's Commission. Message to the H. C. that the Lords agree to the Votes about Hull. Scots Commissioners will send the King's Message and Petition of both Houses. Message from the H. C. about the Votes concerning Hull. Judgement against the Attorney General considered of. E. of Bristol and Justice Mallet, about the Kentith Petition. and for some of the Adventurers Money to be applied to the Relief of Munster. Order for removing the Magazine from Hull. The Petition of Thomas Parramour was read, desiring some Satisfaction may be given him for his Pains in collecting the Poll-money: Hereupon this House Ordered, That the Earl of Essex, the Lord Kymbolton, and the Lord Robartes, or any Two of them, shall receive an Account of Thomas Parramour, Esquire, what Poll-money is received, and what is behind and unpaid; and to consider what is fit to be allowed to the said Thomas Parramour for his Pains and Care in collecting the Poll-money, and report the same to this House. Hodie 1a vice lecta est Billa, An Act, That the County Palatine of Durham shall have Knights and Citizens, to serve in the Commons House of Parliament. The Lords Commissioners reported, "That they had delivered to the Scotts Commissioners the King's Message, concerning His Resolution to go into Ireland against the Rebels, together with the Votes of both (fn. 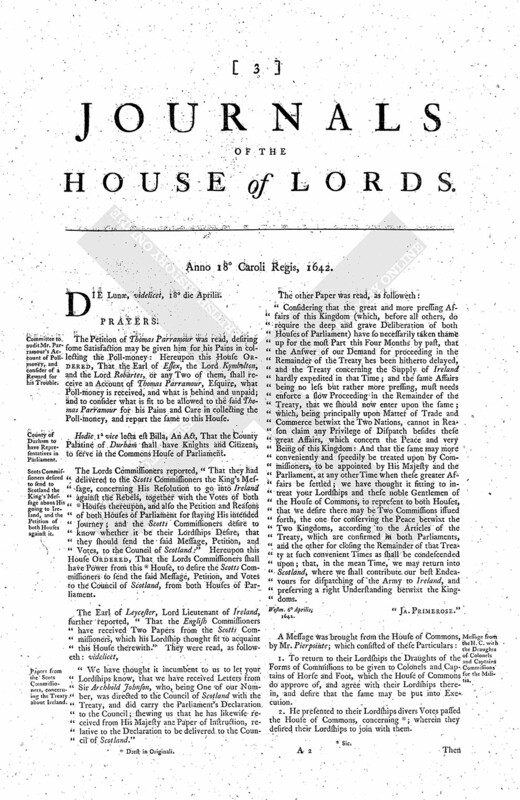 1) Houses thereupon, and also the Petition and Reasons of both Houses of Parliament for staying His intended Journey; and the Scotts Commissioners desire to know whether it be their Lordships Desire, that they should send the said Message, Petition, and Votes, to the Council of Scotland:" Hereupon this House Ordered, That the Lords Commissioners shall have Power from this (fn. 1) House, to desire the Scotts Commissioners to send the said Message, Petition, and Votes to the Council of Scotland, from both Houses of Parliament. "We have thought it incumbent to us to let your Lordships know, that we have received Letters from Sir Archbold Johnson, who, being One of our Number, was directed to the Council of Scotland with the Treaty, and did carry the Parliament's Declaration to the Council; shewing us that he has likewise received from His Majesty ane Paper of Instruction, relative to the Declaration to be delivered to the Council of Scotland." "Considering that the great and more pressing Affairs of this Kingdom (which, before all others, do require the deep and grave Deliberation of both Houses of Parliament) have so necessarily taken thame up for the most Part this Four Months by past, that the Answer of our Demand for proceeding in the Remainder of the Treaty hes been hitherto delayed, and the Treaty concerning the Supply of Ireland hardly expedited in that Time; and the same Affairs being no less but rather more pressing, must needs enforce a slow Proceeding in the Remainder of the Treaty, that we should now enter upon the same; which, being principally upon Matter of Trade and Commerce betwixt the Two Nations, cannot in Reason claim any Privilege of Dispatch besides these great Affairs, which concern the Peace and very Being of this Kingdom: And that the same may more conveniently and speedily be treated upon by Commissioners, to be appointed by His Majesty and the Parliament, at any other Time when these greater Affairs be settled; we have thought it fitting to intreat your Lordships and these noble Gentlemen of the House of Commons, to represent to both Houses, that we desire there may be Two Commissions issued forth, the one for conserving the Peace betwixt the Two Kingdoms, according to the Articles of the Treaty, which are confirmed in both Parliaments, and the other for closing the Remainder of that Treaty at such convenient Times as shall be condescended upon; that, in the mean Time, we may return into Scotland, where we shall contribute our best Endeavours for dispatching of the Army to Ireland, and preserving a right Understanding betwixt the Kingdoms. 1. To return to their Lordships the Draughts of the Forms of Commissions to be given to Colonels and Captains of Horse and Foot, which the House of Commons do approve of, and agree with their Lordships therein, and desire that the same may be put into Execution. 2. He presented to their Lordships divers Votes passed the House of Commons, concerning (fn. 2); wherein they desired their Lordships to join with them. Then the First Vote was read, concerning the removing of the Magazine from Hull; and this House thought fit to leave out these Words ["in case any Person or Persons shall resist or make any Interruption in the Execution of this Order, then"]; and the said Vote being read, leaving out the aforesaid Words, it was Resolved, upon the Question, That this House agrees with the the House of Commons in this Vote, with the Alterations now read. "That Sir John Hotham, Knight and Baronet, John Hotham, Esquire, and all other Persons under their Command, in undertaking the Charge and Command of the Town of Hull, and the Magazine there, and in drawing Forces into the said Town, have done nothing therein but according to the Law of the Land, unto which they were commanded by both Houses of Parliament; who, knowing it to be a necessary Service at this present for the Safety of the Kingdom, do Declare, That the said Sir John Hotham, John Hotham, Esquire, and all other Persons under their Commands, shall have the Assistance of both Houses of Parliament, against any Inconveniences that (fn. 3) they may incur, by yielding their Obedience unto the said Commands in this necessary and important Service." Resolved, upon the Question, that this House joins with the House of Commons in this Vote. For a Regiment of Foot. "By virtue of an Ordinance of Parliament, authorizing me to be Lieutenant of the County of, I do hereby nominate and appoint you to be Colonel of a Regiment of Foot, to be mustered within the Hundred or Hundreds, Lathes, or Wapentakes, or other Division, however it be called, of the County aforesaid; and do further give Warrant hereby unto you to assemble, muster, exercise, and lead the said Regiment, at all such Times, and to all such Places, as by Warrant from me, or in my Absence from my Deputy Lieutenants, or any One of them, you shall be from Time to Time in that Behalf directed; willing and commanding all inferior Officers and Soldiers of your said Regiment to be attending, aiding, and assisting unto you, for the better Furtherance of this Service, by the said Ordinance required." For a Captain of Foot. "By virtue of an Ordinance of Parliament, authorizing me to be Lieutenant of the County of, I do hereby nominate and appoint you to be Captain of Foot, to be mustered within the several Parishes, or Hundred or Hundreds, Wapentakes, or Rapes, or Ridings, or Lathes, or Tithings, or other Divisions, however they be called, of the County aforesaid, or of such a Company of Foot as shall be delivered unto you by me, or in my Absence, by any One or more of my Deputy Lieutenants, by my Command; and further do give Warrant to you to lead, train, and muster the said Foot Company, at such Days, and such Places, as by Warrant from me, or in my Absence from my Deputy Lieutenants, or any of them, you shall be from Time to Time in that Behalf directed; and likewise do give Power to you to nominate such Lieutenant, Ensign, and other Officers under you, as shall be necessary for that Purpose; willing and commanding all such inferior Officers and Soldiers of the said Foot Company to be attending, aiding, and assisting unto you, for the better Furtherance of this Service, by the said Ordinance required. "Any of these Words of Distinction may be used as shall best be applied to the several Companies. "This is to serve for the Horse as well as the Foot, mutatis mutandis, the general Words." That this House will put the Commissions to Colonels and Captains into Execution presently; and concerning the Two Votes touching Hull, their Lordships will send an Answer, by Messengers of their own. To let them know, that this House agrees with them in the Two Votes concerning Hull; leaving out the few Words in the First Vote. The Earl of Leycester, Lord Lieutenant of Ireland, reported to the House, "That he hath acquainted the Scotts Commissioners with their Lordships Desire, that they would send the King's Message, expressing His Resolution to go to Ireland, and likewise the Petition and Reasons of both Houses of Parliament against His Majesty's going, to the Council of Scotland; and they will accordingly send them." Ordered, That the Earl of Bedford is excused for his Absence from this House this Day, because of his ill Health. That the House of Commons do agree with their Lordships, in leaving out those Words in the First Vote, concerning removing of the Magazine at Hull. Next, this House took into Consideration what Judgement to give against Mr. Attorney General, upon the Impeachment brought up from the House of Commons. The Message from the House of Commons of the 14th of this Instant April, to desire their (fn. 4) Lordships to give Judgement against him, was read; and likewise the Resolution of this House of the 15th of March last [ (fn. 5) was read,] "That this House holds Mr. Attorney General fit to be sentenced upon the whole Matter for a Crime." 1. That Mr. Attorney General be, by Sentence of this House, disabled and made incapable of being a Member, Assistant, or Pleader, in either House of Parliament, and of all Offices, saving that of Attorney General, he now holds. 2. The Question being put, whether Mr. Attorney General shall be disabled to be a Witness in any Court of Record, in any Criminal Cause? 3. The Question was put, whether Mr. Attorney General, by Sentence of this House, shall be committed to Prison, during the Pleasure of this House? Ordered, That Mr. Attorney General shall be forthwith committed to the Prison of The Fleet, there to remain during the Pleasure of this House. Ordered, That the Earl of Bristoll and Mr. Justice Mallet shall be examined this Afternoon, before the Lords Committees, concerning the Kentish Petition. A Message was brought from the House of Commons, by Walter Longe, Esquire; who brought up to their Lordships some Propositions, which the House of Commons have received from some Persons, for an Adventure by Sea to Ireland, upon Condition they may be admitted to have Share of Land in Ireland, for the Money which they shall disburse in the said Sea Adventure; and that the House of Commons have passed some Votes hereupon, to which they desire their Lordships Concurrence. And further, to desire their Lordships Concurrence in an Order for the issuing out of Six Thousand Pounds, out of the Adventurers Money, for the Relief of the Province of Munster. That their Lordships will send an Answer, by Messengers of their own, in convenient Time. Ordered, That the Cause of the Lord Viscount Loftus shall be further proceeded in on Wednesday next. 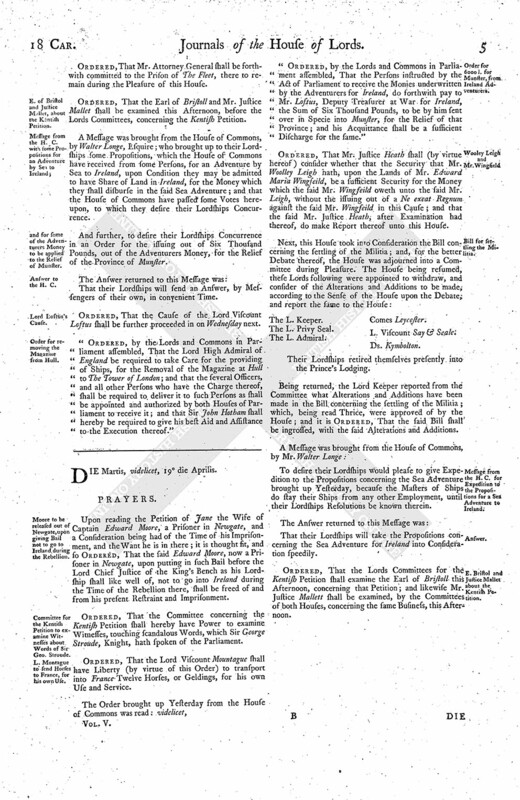 "Ordered, by the Lords and Commons in Parliament assembled, That the Lord High Admiral of England be required to take Care for the providing of Ships, for the Removal of the Magazine at Hull to The Tower of London; and that the several Officers, and all other Persons who have the Charge thereof, shall be required to deliver it to such Persons as shall be appointed and authorized by both Houses of Parliament to receive it; and that Sir John Hotham shall hereby be required to give his best Aid and Assistance to the Execution thereof."